Oblique aerial view. Cropped image. The Pict's Knowe, a small defensive enclosure, possibly of a domestic character is a low mound of sand fortified by a ditch, with a rampart on the outside. The central area measures some 60 feet in diameter; the ditch about 26 feet across and 5 feet deep; and the rampart 31 feet in width from the bottom of the counter- scarp of the ditch to the base of the scarp outside, and 3 feet in height above the outer ground level. A broad roadway leads out across the ditch towards the east, where there is higher ground beyond and has probably been widened in modern times by material from the rampart partially demolished at this point. RCAHMS 1914; F R Coles 1893. Generally as described above. The central area is c. 18.0m diameter while the ditch is c.10.0m wide and c.1.7m deep on average. The outer scarp of the rampart varies in height from c1.2 on the North to barely visible on the NE. The site is overgrown with grass and is slightly mutilated. Ploughing has reduced the outer face of the rampart in places. Visited by OS (WDJ) 6 July 1964. A first season of excavation took place at this small henge monument, in response to serious damage by cattle trampling, rabbit burrows and tree root disturbance. The greater part of the interior of the monument was excavated, together with a cutting through the bank on the western side of the henge, and ditch sections on the W and at the northern terminal. An EDM survey of the monument and its immediate surroundings was undertaken, together with a detailed survey of the visible damage to the site in advance of excavation. Within the interior, all traces of archaeological features had been destroyed by rabbit action, although sample sieving of the topsoil in metre squares produced sherds of probable early Bronze Age date and fragments of cremated bone. 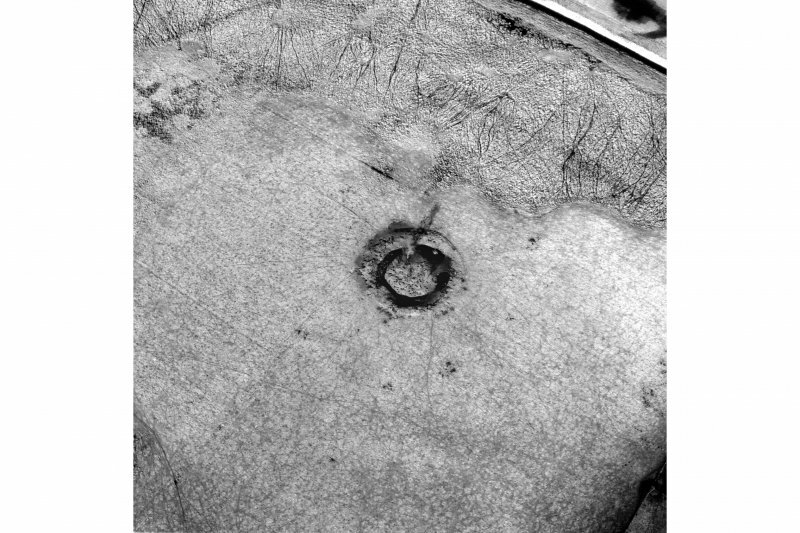 In the entrance to the monument, the surrounding peat lapped up over the sand surface, preserving an undamaged surface. Here, large numbers of stakeholes were found, clustered around the ditch terminals and around two linear slots lying at right angles to the entrance way. The upper layers of the ditch were composed of peat, which contained perfectly preserved leaves, reeds, turves, roots, nut shells, fruit stones and beetle cases. Beneath this, in a more silty material, were several large wooden objects, including two planks and a complete ard plough. This ard is rather unlike others known from prehistoric contexts in Europe. If radiocarbon determinations demonstrate that it is late Neolithic/early Bronze Age in date, it will probably represent the earliest known example of a plough from north of the Alps. The organic silty day proved to fill a recut in the henge ditch, and when removed revealed a series of truncated primary silts, whose laminated character suggested that they had been laid down in wet conditions. These layers contained very large quantities of waterlogged wood, quite different in nature from that in the layer above. This material included chips which had evidently come from woodworking on site, together with numerous fragments of hurdlework. Taken in the context of the stakeholes on the surface, these suggest that the henge had originally had a complicated superstructure of hurdling. 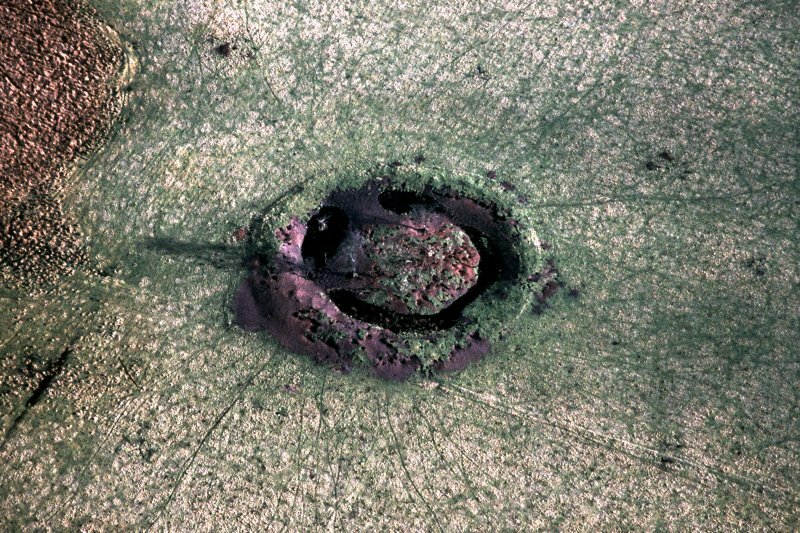 NX 953 721 The Pict's Knowe is a penannular earthwork monument, located roughly 2km SSW of Dumfries, in the valley of the Crooks Pow stream. It sits on a small sandy eminence which breaks the surface of the peat covering the valley bottom. In 1990 the site was identified as a possible henge monument of Neolithic date. The first season of fieldwork, in 1994, concentrated on the interior of the monument, which proved to have been heavily damaged by rabbit activity (Thomas 1994). The 1995 season concentrated on the excavation of a large proportion of the ditch. This research confirmed that a major episode of recutting had taken place at some time after the ditch deposits had stabilised and a turf had formed over their surface. However, the recut was not uniform, and while it took the form of massive craters in the two terminals and opposite the entrance, it was more slot-like, or entirely absent, at other points around the circuit. The irregularity of the recut was reflected in the density of cultural material found in the green clay fill. Great quantities of worked and unworked wood and smashed quernstone fragments were recovered from the recuts in the terminals and at the back of the enclosure, while elsewhere the material was more scarce. At the back of the monument the recut had been covered by a platform of timbers, and in other places some effort had been expended in covering or hiding the recut deposits with wood or laid clay. On the northern side of the enclosure, metalworking residues were found on the bank, contiguous with a late stage in the ditch sequence, and a number of crucible fragments were found on the site. Radiocarbon dates demonstrated that the recutting had taken place in the early centuries AD. surrounded the monument. Surprisingly, the build of the bank carried on unbroken as a levelling layer across the entrance and spreading out into this area. Beneath this layer of soil and stone was a small oval mound, bracketed by two large post-holes, from which the posts had evidently been withdrawn. The mound covered a large oval pit which contained no artefacts, and it shared its alignment with the enclosure. The two posts aligned exactly with the terminals of the ditch. 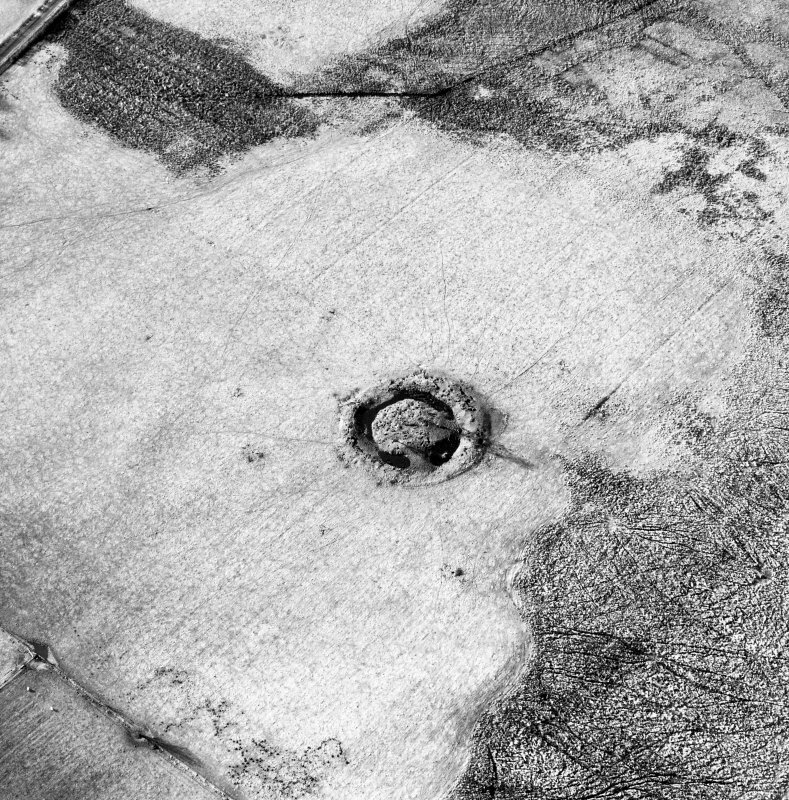 Seemingly, this early complex of features had influenced the layout of the henge monument, but had been deliberately hidden in the process of constructing the bank and ditch. Work in 1996 and 1997 concluded the investigation of the entrance, and involved the opening of two trenches to the S of the monument, to evaluate a series of possible ring-ditches identified by geophysical survey. 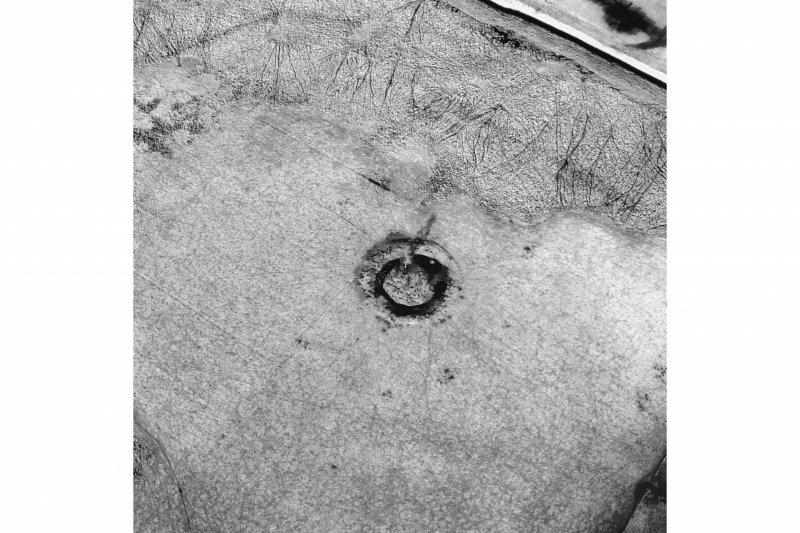 The results were negative, but the trenches demonstrated that the scatter of stake-holes surrounding the monument extended to the S. Finally, a cutting was made through the bank on the southern side of the henge, to investigate the structure of the bank itself and to expose the pre-bank land surface. The latter proved to contain a dense concentration of earlier Neolithic pottery and flintwork, and a series of cut features, including one small pit packed with sherds from at least seven vessels, and a flake from a polished stone axe. Radiocarbon dates of 2452?1900 cal BC and 2454?2030 cal BC (at 2s) have now been received for the black peat immediately below the bank, which are reasonable for a late henge monument. 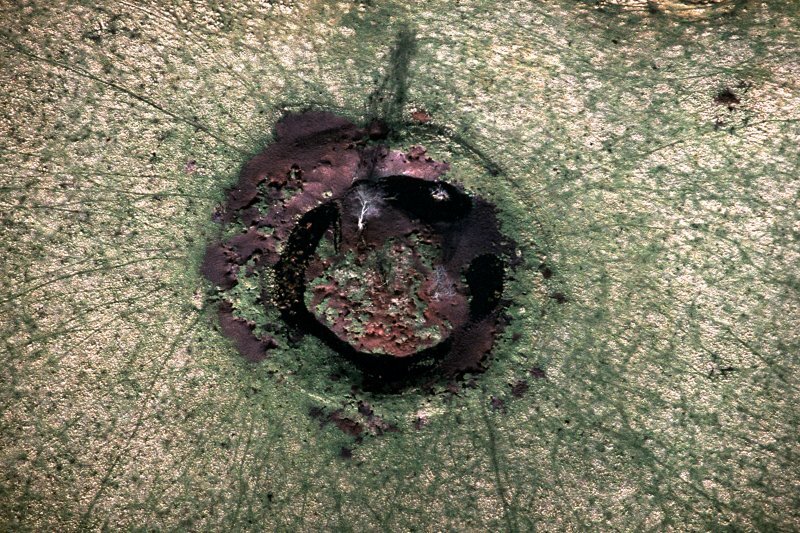 This site is plotted on a distribution map of henge monuments and penannular ring-ditches covering southern Scotland (RCAHMS 1997, 116, fig. 111). Information from RCAHMS (ARG) 30 September 1997.